five steps to live in balance. When we have fuzzy priorities, it’s no wonder we keep complicating our lives. Any life-balance problem usually isn’t so bad when we’re in our 20s and 30s, the time in life when we’re young and problem solving is pretty straightforward. And since we’re young, the responsibilities aren’t usually that bad. They’re usually pretty manageable. We normally can find a way to figure it out. connect with family, friends, and God. discover what REALLY matters in life. The majority of the people I work with — and these are educated people, professionals, high achievers, executives, people in ministry, spouses — they all keep asking me for some kind of a magic potion for problem solving and balancing their life. They say things like, “Just help me hold it all together.” It’s as if they think I have the power to give them a 36-hour day. Well, here’s the bad news: Balance is a myth. No elixir exists. There’s no potion out there that’s going to give you the 36-hour days or give you a balanced life in which you can do it all. Something’s got to give. If you try to appease all of the voices, all those constituencies out there who keep hammering on you for your time, you will eventually let some of them down. And worst of all, you’re going to end up killing yourself. Someone or some group is going to get shortchanged either intentionally or subconsciously if you keep trying to do it all. But I want to give you a ray of hope in this: It is possible to set clean boundaries and to release some of the responsibilities you thought you had to maintain. It is possible to return to a life of sanity, problem solving, and more fulfillment. You’ll find that when you release some of these things you thought you could never let go of, you’ll wonder why you waited so long. During the crunch-time years, usually in our 30s, 40s, and 50s, when we’re forced to give something up, most of us choose to ignore the least squeaky wheel in our lives. And you know what that usually is? The family. I’ve found in working with more than 600 high achievers that with very few exceptions all of the lame clichés that go something like, my family comes first, are simply platitudes. They mock what really happens. Delaying family needs, especially the husband-wife relationship, is the easiest for us to rationalize when we’ve got a ton of things going on. Yet, each one of these rationalizations, each late-night meeting, each crisis at the office, or the weekend problem solving, each one of these withdraws harder in funds from the inner personal bank account of our loved ones, emotional and connection funds that are very expensive to replace at a later date. in which you are always fulfilled. Don’t believe me? Ask the executive fathers who have teenagers, who are now seeking a deeper relationship with their kids after years of absence while they focused on their careers. The currency of this inner personal bank account isn’t money, but it’s time and tenderness. And these are rare commodities for most absent parents who long to connect. But I’m going to pose to you, there is hope. It is possible to release the obligations we thought we had to hold and to reclaim a vibrant relationship with our loved ones. Often, we somehow meet family and vocational needs, but we give up our personal needs. We postpone getting fit, enjoying recreation, or making time for solitude, prayer, or reflection. We just don’t have time for these. But these are the activities that keep us sharp and alive. We say something like, “I know I need to do this, and I really want to, and I’m going to get at it next year. I’m going to make that resolution, I know, next New Year’s. Once my life comes down, I’ll really be able to attack this,” but it never happens. You’ve probably figured out life never calms down. There’s always just one more hill to climb, one more deal to close, one more quarter to make, one more board to sit on, one more team to coach, one more crisis. There’s always one more problem-solving, stress-inducing, time-involving priority. But, again, I’m going to ask you to take heart; there’s a way out of this. If we closely examine the patterns of how we commit, we can start to hold back on these commitments. We can get out of this place of over-committing and live a life in which we’ve chosen the right priorities for ourselves and our loved ones. So these are the steps to getting balance back in your life: The first step is to admit two things to yourself. The first is: This isn’t working. The second, I can’t have it all. If you’re still trying to figure out a way to do it all, to have your cake and eat it too, well, I’m going to tell you straight out, you’re in denial. I can’t help you. But if you’re willing to examine some of your life’s patterns and admit that parts of your life aren’t working and that you can’t have it all, then I’ll pose to you, you’re in a place where you can get your time and your sanity back. The second step for getting your life back after you’ve accepted that you can’t have it all is to set and enforce boundaries in your life. Do this directly, cleanly, and, if necessary, bluntly. Setting boundaries means telling people very exactly what you will and will not do. Another positive side effect, setting and enforcing boundaries may be very tough at first and it could cause some tension and conflict, but if you stick by your word, I believe you can deliver the message respectfully and you’ll be in a healthy, enduring relationship. And here’s the huge bonus: You’re going to have more time. The third step for problem solving and restoring balance in your life is to start telling yourself right now you don’t have to do anything. About the only things you and I have to do are to breathe and to have our heart beat. And I’ll tell you, in my life, at least, those things happen automatically anyway. I’m asking you to consider that every action you take is a conscious choice. Sure there are consequences, but you are doing the choosing. The key question is, are you willing to accept the consequences? If you are, then honor your choice. If not, then choose not to do the action. Do this even though others may not like it and they may not even buy in. If you do this consciously, you’re acknowledging the risk, even though it’s a small one, that the relationships might end. But be conscious about it. You are making choices. The fourth step for restoring balance, find some people in your life who are good at setting and enforcing boundaries. Let these people become your mentors. If you find that you struggle with balance and boundaries, find people who both seem to get a lot done and also seem to have all the time in the world. Who are your role models for people who have good boundaries in their life? Ask them to be on your personal board of directors, to be a coach to you, to help you set and enforce your own boundaries. Ask for their encouragement; ask them to hold you accountable. Use them as an alcoholic uses his sponsor so that you can call them whenever you’re considering a project or a relationship that is on the fringe of your boundaries that might corrupt the balance in your life. Have these friends or mentors guide you in clearly resetting your boundaries so that you have time for what you’ve declared to be important in your life. And give them permission to both be your cheerleader when you’re doing what you want and, also, to cut it short when you start whining and making excuses. There’s one final step for solving problems and restoring balance in your life. And that’s to find a group of friends, a community, who will express their love for you no matter how much or how little you do. Having friends or loved ones who will stand by us and love us when we make these tough choices gives us the confidence and support to make these choices and to stand by them. A direct, truthful, forthright message delivered with compassion can communicate our boundaries cleanly, clearly, and tenderly. And friends that support us also help us stay firm in our choices and not be swayed by the pleas and the bargaining and the rationalizations and all the threats of others who want our time. As mature adults, we’re never forced to do anything. We always know we’re making a choice. Anytime you find yourself saying, “Well, yes, but I have to,” you’re becoming a victim. And you’re honoring the treadmill way of life. There are always three choices that we have: To do something, to not do something, and to try to find some other approach. The choice is up to you. Once you've found money, success, position, and power, what do you do when you still feel unfulfilled? Introducing a straight-talking series on how to navigate through some of the greatest challenges of life. Are you searching for lost passion and energy? Do you feel that your career has become your identity? Do you want to find and dedicate your life to goals that make a difference in the world? Do you long for greater intimacy and connection with your spouse, family, friends, and God? Are you ready for a change? If so, then this program is just the ticket you've been waiting for. When Having It All Isn't Enough: Resolving the Top Ten Dilemmas of the High Achiever is a straight-talking audio series on how to navigate through the biggest issues of midlife transition: identity, life purpose, money, power, control, balance, relationships, and spirituality. 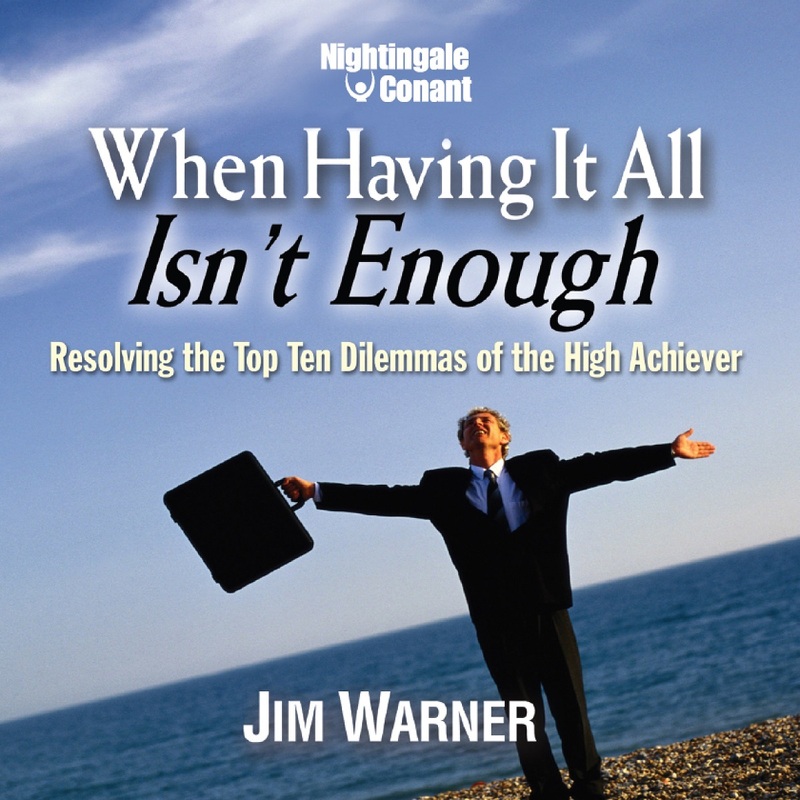 As an internationally recognized counselor and mentor to entrepreneurs, corporate executives, professionals, and people in ministry, former CEO Jim Warner outlines the challenges faced by high achievers with a candor that is both refreshing and inspiring. Having enjoyed material success - and endured personal self-doubt, career second-guessing, and fragile relationships - he speaks with the authority and insight of a leader who has rediscovered a life filled with vocational passion, intimate relationships, true wealth, and spiritual connection. In this riveting series, Jim offers a blueprint for life transformation that resonates with both integrity and originality. He shares with you the key principles, proven strategies, and results-oriented action steps he has developed and used to guide hundreds of high achievers out of their "stuckness" into a place of passion, purpose, gratitude, wisdom, and serenity. Your life is not about you… you are about life. It is impossible to be grateful and unhappy. Freedom from money anxiety comes when you view your life role as a steward versus an owner. The hard truth, spoken with tenderness to a loved one, is the most direct way to achieve true intimacy. Boundless energy is available to you when you practice truth, compassion, and forgiveness, and carve out times for solitude and reflection. Almost all the voices floating around inside your head are really looking out for your own good. No matter how distressed, stuck, or fragile you may feel, all is well and you are loved. Jim presents the comprehensive toolkit for a "personal life audit" - the key questions you need to ask yourself, and the corresponding pressure points you need to probe to claim your greatness. This audit examines the eight fundamental areas in your life: Purpose, Money, Balance and Boundaries, Energy, Marriage and Love Relationships, Friends and Community, Spirituality, and finally, Your Identity. I want to maximize the eight fundamental areas of my life: Purpose, Money, Balance and Boundaries, Energy, Marriage and Love Relationships, Friends and Community, Spirituality, and My Identity. When Having It All Isn't Enough at the special price below. — I can select one of two ways of ordering.